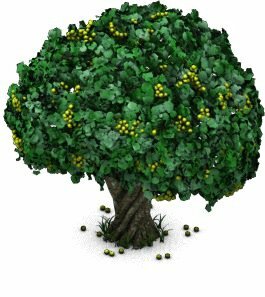 My Vineyard is a Facebook application game by Metaplace, Inc. The concept for My Vineyard is that you have inherited a vineyard and it is now yours to run. Once you have completed the tutorial you are free to plant more grapes to start the next batch of wine, or buy decorations for your vineyard! Some players have reported not having the tutorial. If you miss it, you can proceed on with the game anyway. You will have a group of plowed plots on which some mature grapes are ready to harvest. 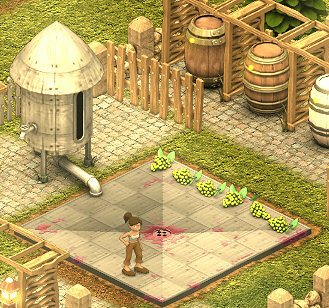 Simply clicking on the grapes will allow you to harvest them, which moves them to the crush pad . Once the grapes are on the crush pad, click on each bunch so that your avatar will proceed to stomp the grapes. As your avatar stomps the grapes one bunch at a time, the juice from the grapes is moved into the storage tank behind the crush pad. You will see a red indicator rise in the window on the front of the storage tank. 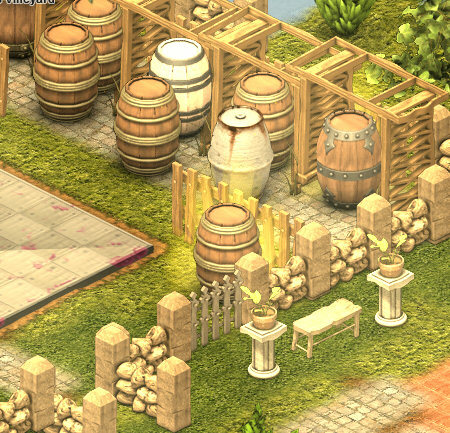 Clicking on the storage tank will prompt you to choose to either see "Details" or put it in a barrel and allow it to age. If you click "Details" you will get another separate pop up window which tells you exactly what you have in the tank: number of grape bunches and which varietals. After you have reviewed this information you can go back to the previous window where you choose barrel. When you click on barrel, the Market will open with your choice of barrels. If you do not wish to barrel your grapes at this time, simply close the Market window. If you want to sell the juice you just crushed right away, simply choose a Plastic Barrel and sell it. If you want to age the juice into wine for more money, choose a barrel and age it. You can put all of one kind of grape into a barrel or mix different grapes together in one barrel if you wish. If you want to age full barrels, you will need to crush 36 bunches of grapes to fill your storage tank. You can also barrel juice if your tank is not full; simply by clicking on your tank at any time! Select your barrel and then wait as it ages. There is a limit to how many barrels you can have at any given time. 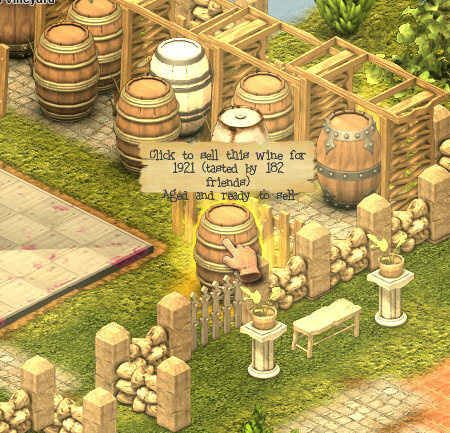 As you level up in the game, you'll raise your barrel limit as well as unlock new barrels that will make better quality wine and therefore allow you to score higher reviews and yield a higher amount of coins. Another great way to advertise wine and have visitors is by having a tasting. Click on any aging barrel to start a tasting. This requires you to post to your Facebook wall to invite your friends to come taste your wine. It is fun to see how many tastings you get and your visitors will earn coins and xp's! After you are finished stomping grapes and the juice is in your storage tank, you have the choice to buy a barrel and sell the juice right away or age it for a better score. A fully aged barrel of wine is more valuable and will sell for more than juice that has just been barreled. If you decide to allow your wine to age, when it is fully aged and ready to sell, it will acquire a golden glow (see pic). Placing your cursor on the barrel will give you its current statistics (see pic). 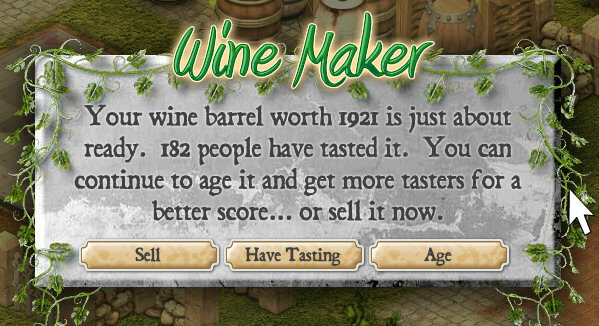 Clicking on the barrel will give you the choice to go ahead and sell it or continue aging it or have a tasting for an even higher rating (see pic). The value will not increase after it is fully aged. If you decide to sell, choose that option and you will collect the coin value for that barrel of wine. 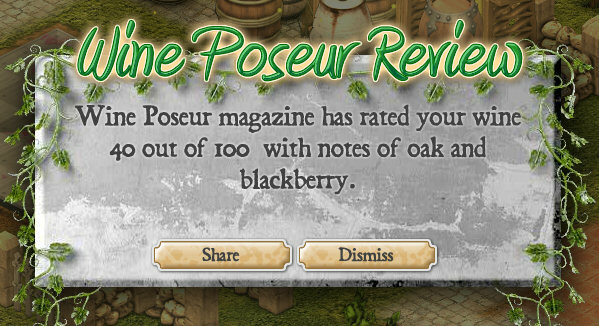 After the sale is final and you have collected your coins, your barrel will be gone and you will receive a notice that your wine has been reviewed by Wine Poseur Magazine; you will be told the score and tasting notes of the wine (see pic). To plant grapes that will eventually grow to be your next wine vintage, click on an empty plot on your vineyard. (Again, no need to "plow" these plots. 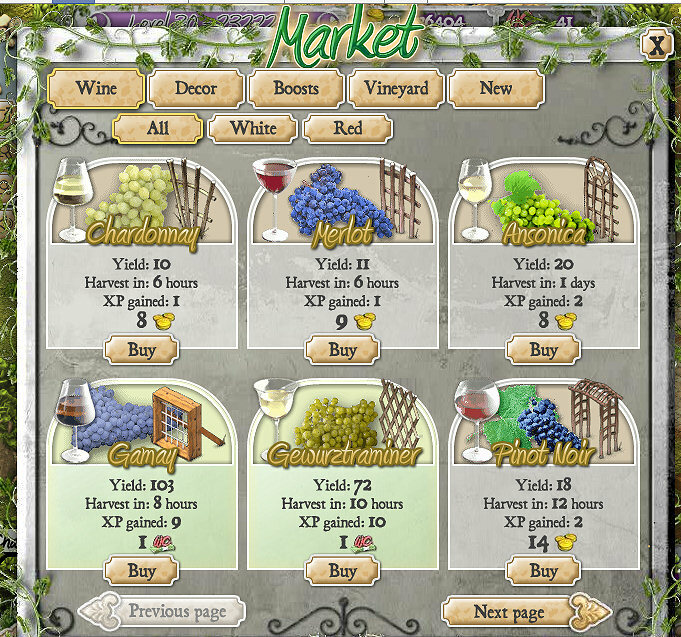 After grapes are harvested, the plots are ready for new planting) Clicking on an empty plot will open up the Market, and you'll be able to select a variety of grapes. Every player starts with Chardonnay. Select the Chardonnay and then click the empty plots. You will then move around and plant the field with the Chardonnay grapes! Each grape takes a different amount of time to mature and become harvestable, so come back when the grapes are grown to harvest them and move them to your crush pad! 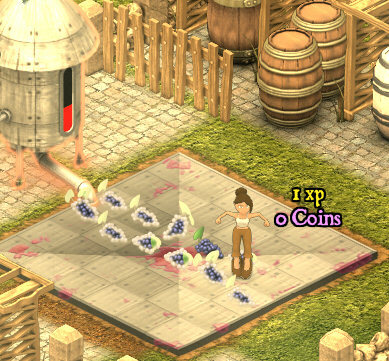 You can also ask your friends to fertilize your crops, which will give you 1 extra XP when harvesting! Once grapes are ready to harvest, they will not wilt or wither; they will wait for you! The Marketplace holds all of the available decor that you can purchase with gold and Wine Cash. Here you'll find many items including houses, fences, trees, rocks, and other decorative objects. 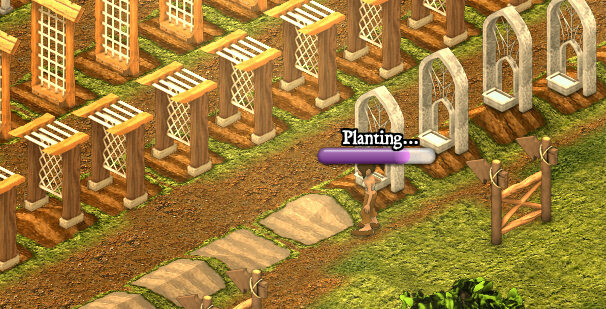 On May 10, 2010 harvestable trees were introduced to the game. Apple Trees can be bought with coins and Olive Trees are purchased with Wine Cash. According to the game developers, "These trees will give you coins, and occasionally bonus XP!" 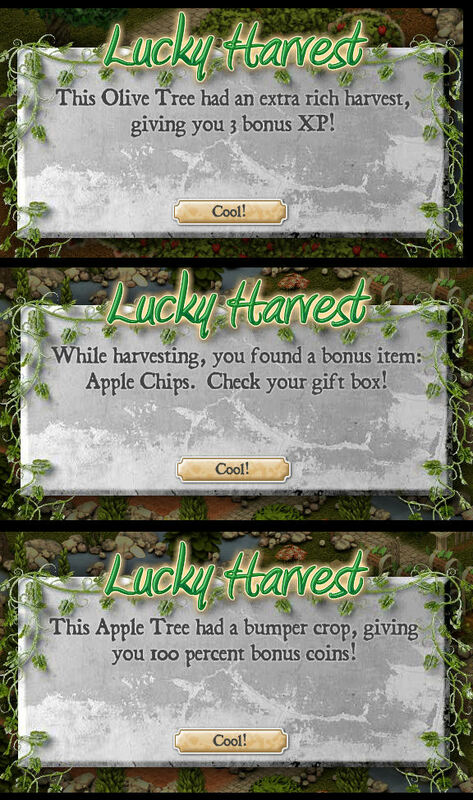 Various bonuses are randomly awarded on occasion when harvesting. See Pic: Bonuses for an example of these. When the trees are ready to harvest, fruit will be visible on them and placing your cursor over them will tell you they are ready to harvest. 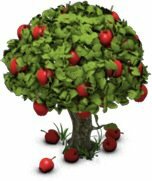 Just click on each tree; the fruit will be harvested and sold in one step. The trees will begin a new growing cycle and the coins for the sale of the fruit will go into your bank of coins. This is the collection of tools you have to use in playing the game. Following is an explanation of how each tool is used. The is the Multi Tool. Use it for selecting objects. This is the Move/Rotate Tool. Use it to move objects by clicking on them and dragging them to a new location. Use it to rotate objects by clicking on them and then clicking on the green arrows. This is the Delete Tool. Use it to delete objects, including plots for growing grapes. This is the Market Tool. It opens the Marketplace where you can buy everything you need in the game. This is the Gift Tool. Click it to open your Gift Box and access the gifts you have received from other players. When you have "lost" an object OR you can see a truffle but cannot pick it because it is under an object, there is a way to make most of the decorations on your vineyard transparent. This will help you to find objects (like barrels) that are hidden behind other objects or get to those trapped truffles. Just hold down your Shift key while pressing the letter T. You MUST do this while you are NOT in Full Screen Mode. If you are already in Full Screen mode, you will need to leave that mode long enough to engage the Shift+T to make things invisible; then you can reenter Full Screen mode if you desire. 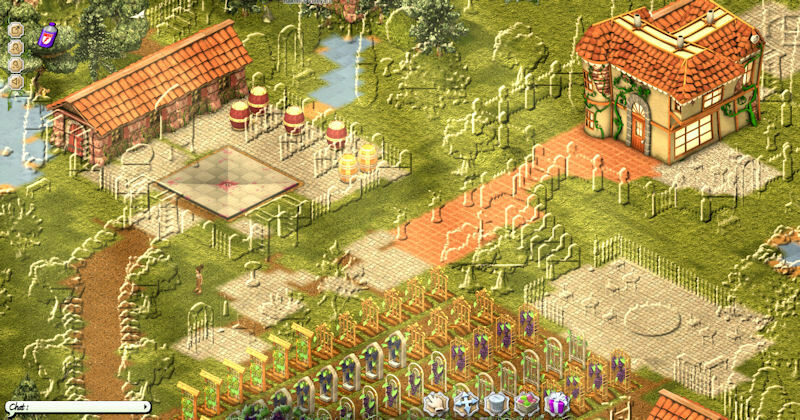 When you want to see everything again, leave Full Screen mode, hit Shift+T again and objects will no longer be transparent. See this PICTURE for an example of what your vineyard will look like while using Shift+T. You will observe that you can still see barrels, houses and grapes. But other objects are transparent. Guess what My Vineyard players? If you type /dance in your chat bar, you will now do one of TWO RANDOM DANCES! You can also try typing /wave to say hello to visitors! Give it a try! Also if you use the space bar you can make your avatar jump. Using the arrow keys on your keyboard will allow your avatar to run. Note that you have to be in "regular screen" to type in the chat window. Ray Peterson has put a lot of time and effort into his notes on how to calculate your wine score, wine sale, and a list of the words used to describe the notes of wine that you may see when creating your own blend.